Julian “El Niño Artillero” Yedras opened the doors for the Mexican Media on Wednesday, June 20th, exactly one month before his Boxeo Telemundo debut, to show off his great conditioning as he concludes the last 4 weeks of camp in the high altitude of Mexico City, Mexico. The media workout included a sparring session, pad work, double bag, and finished off with a few interviews for the press. Yedras is very confident of dethroning current WBO/NABO flyweight title holder Jonathan “Bomba” Gonzalez (20-2 12KOs) of Caguas, Puerto Rico in his U.S Debut and feel’s he has the international experience to do so. Yedras was the #2 contender in the world when he fought Japanese superstar Kosei Tanaka for the Vacant WBO World Minimum weight title and come up short in a tough decision loss to the hometown favorite. 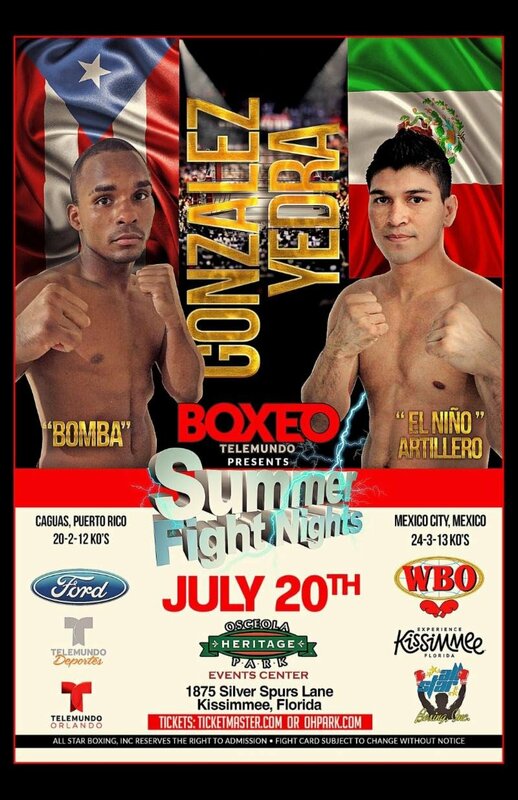 All Star Boxing, INC President & CEO Felix “Tuto” Zabala is excited to continue the Puerto Rico vs Mexico legendary rivalry on Boxeo Telemundo’s summer series and say’s this fight has all the tools to become fight of the year candidate on the network.